First request the Bluetooth control screen by selecting the BLUETOOTH menu entry as in the BriJ Options menu . Components of this control screen are illustrated in what follows. 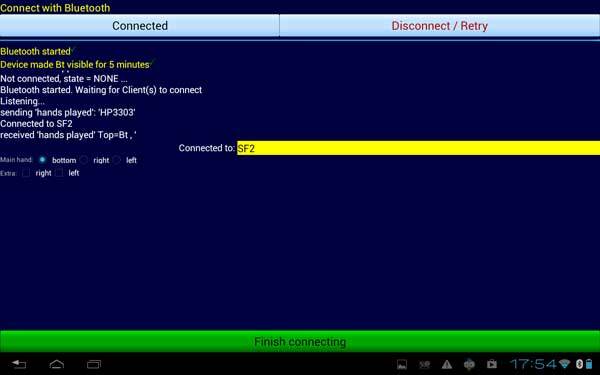 When the bluetooth connection has been started by our BriJ server, the other android device can connect by touching the Join Bt Game button. Once the connected message appears, you can touch the Finish connecting button (which has now turned green). Note the bluetooth icon shown on the North playing surface. The other player will also see an icon in this position, as both players will be seated at the bottom of their android screens. The other player will see the lower hand as North.